A Lockheed Martin-made spacecraft designed to study Mars’ deep interior has traveled halfway towards the red planet. NASA said Tuesday the Interior Exploration using Seismic Investigations, Geodsey and Heat Transport or InSight spacecraft covered 172M miles since it was launched in May aboard United Launch Alliance’s Atlas V rocket from Vandenberg Air Force Base in California. The space agency also confirmed that the science instruments aboard InSight, such as the Seismic Experiment for Interior Structure, Heat Flow and Physical Properties Package and Rotation and Interior Structure Experiment systems, are functioning normally. SEIS will be used to measure Mars’ ground motions over various frequencies, while HP3 will calculate the amount of heat escaping from the planet’s interior. Meanwhile, RISE will use InSight’s radio connection with Earth to record changes in Mars’ rotation axis. 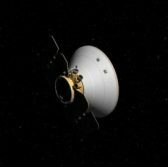 The spacecraft is expected to land on Mars on Nov. 26 and perform its scientific mission through Nov. 24, 2020.